Yacyreta’s hydroelectric power plant generates an approximate storage level of 78.50 masl. The elevation of the final storage level to 83 masl will produce a substantial improvement on the power generated by the turbines that must be evacuated to the consumption centers through the interconnected system in 500 kV. One of the transmission lines collaborating with this matter is The Extra High Voltage Line 500 kV – Rincon de Santa Maria – Mercedes – Colonia Elia. This one begins near the hydroelectric power plant and goes from north to south of Corrientes and Entre Rios provinces until it reaches Colonia Elia. The Line covers 281 km in the North Stretch and 386 km. in the South Stretch covering a total of 667 km. The power is transmitted through three phases R, S, and T. Each of them has a bundle of 4 cables. Cables are protected against lightings through two steel ground wires. The wires are protected against lightings through steel wires, called “ground wires”, set over the three phases. One of the wires contains a fiber optic in order to transmit data between the main transformer stations. Taking into account a certain conductor length, when the transmission voltage is low the energy losses increase substantially in such a way that according to the power to be transmitted and the longitude, in our case it was necessary to employ a voltage of 500 kV to make the project feasible. Each one of the 4 conductors of each bundle is a modified Peace River wire consisting of an internal plait of 7 steel threads (total 31.92 mm2) that provides resistance to the whole and a plait along the perimeter of 48 aluminum threads (364,63 mm2 total) that confer electric conduction capacity. The conductor’s insulation is done through the surrounding air. For this reason, different structures were set throughout the route. These structures support the wire to certain distances so as to impede discharges and at the same time they make everything stable in normal conditions and with an adequate safety level in view of destructive effects. The line layout is a succession of stretches forming a polygonal which was designed bearing in mind, not only the different hills and valleys, constructions or plantations in the way, but also the geotechnical and hydrological conditions found in the area. The conductor bundles are linked to the towers through chains of retention and suspension insulators respectively which were tested in laboratories to check their mechanic aptitude and electric insulation. Each stretch of the polygonal is supported by lattice steel suspension towers, that is to say they load predominantly in transverse way. And at the end of each section, lattice steel angular retention towers were placed. These ones support the loads of wires coming from adjacent sections, plus the climate conditions in any possible way. The suspension towers designed are the ones with the most modern and economical design, i.e. Cross Rope Towers. This type of suspension structure is formed by two lattice steel masts. Each mast has a couple of guys that hold it through the sides towards the front and the back, and are linked through a Cross Rope wire. This wire is a transversal catenary to the direction of the line that holds three polymer insulators that sustain the wires. The retention towers are similar to the suspension self-supported towers but sturdier. All the towers were designed and their prototypes tested in the Test Station that the manufacturer had in Belo Horizonte, Brazil. The foundations employed for the structures varied greatly according to different factors such as the characteristics of soils, the presence of water and the accessibility of the construction equipment into the area. The foundations of the masts of Cross Rope towers were done with pre-molded direct foundations when their transportation was possible, direct foundations concreted in situ, large diameter piles from 0,60 to 1,20 m.
Guys’ foundations were resolved by AIA injected anchors ISCHEBECK type. They consisted in a pre perforation with a steel hollow bar of high resistance. The length varied with the characteristic of soils. After that, grout rich in cement was injected at high pressure to form a traction pile in order to guarantee the guy’s working load plus a safety rate. After being injected, all the anchors were tested for rupture load. The foundations of the self-supported towers were done directly in situ when the soil allowed it. In some cases, depending on the type of soil, such towers were founded through concreted piles in situ or traditional pre moldered piles. In other cases where the water level was high it was necessary to work with elevated porches, as in the case of Rio Miriñay Crossing, where the towers are lifted between 7,00 and 8,00 m above natural land level. 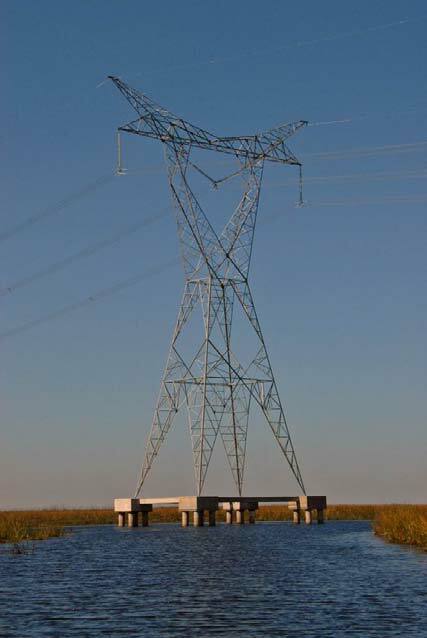 COINTEC from The Argentinean Chamber of Engineering Consulting (Cámara Argentina de Consultores de Ingeniería) was in charge of the executive design of this Extra High Voltage Transmission Line. After knowing the power to be transmitted and the distance to which it must be transported, an electric study of the line is carried out. From this one the transmission voltage, conductors disposition and conductor section are selected in a way that different electrical considerations are taking into account, such as minimizing losts. This calculation corresponds to Electric Engineering. Like I’ve said, in the case of the line described above, the voltage is of 500.000 V, i.e. 500 kV which in electric jargon is called “extra high voltage”. From voltage, conductors section and their spatial disposition definition, the civil-mechanical design of the line starts. I will try to sum up and simplify the different stages of design in order to make my writing more comprehensible to those who are not familiarized with this kind of design. Even though lines’ design has many more steps in between, their absence will not change this writing’s conclusion. Projects climate conditions can be defined by previous studies, regulations or weather analysis. In terms of climatology we have no CIRSOC since in our case what we analyze is the possibility that wind speed may be stronger in some parts of the line. For this reason, probabilities, different from those of the regulation already mentioned, are analyzed. By means of a probabilistic analysis of severe storms registered in relation with the physical damage they cause in a determined amount of time along the area where the line is going to take place, different wind speeds and load conditions are defined. This data is the starting point for the designer. Conductor mechanical calculations, structure load hypothesis and failure sequence. Once defined the conductor section by electric design, the mechanical calculation corresponds to the definition of the conductors’ electric wiring voltages associated with every one of the climatic conditions. The calculation is done through the application of the equation of the catenary with special compatibility considerations between aluminum and steel, and special creep considerations due to the slow flow over time. These designs are similar in nature to those employed in bridges shrouds. From the voltage verified in the conductors and the guard wires for each climatic state, diagrams of the loads that the wires transmit to the structures are obtained. The loads go from the wires to the structures and the foundations with different failure sequence rates. For this reason, the most suitable failure mode to the design has to be selected before hand. The towers’ geometric design is done followed by the mechanical-civil design. For this kind of lines, the structures are made of steel lattices of galvanized steel angles with special quality bolts. All the safety and protection distances used in the tower’s geometrical design depend on each country’s own regulations. Moreover, in some cases international regulations are taken into account such as IEC (International Electrotechnical Commission) or CICGRE (Great Electric Networks Committee). Naturally, wire goes with the whole line. Appropriate and economic designs as well as a disposition of structures and foundations are what optimize the line’s costs. Structure’s design evolved along the time in such a way that lighter and more economical structures are being made. Self-supported towers designs evolved into guyed V structures and more recently into Cross Rope designs in order to minimize production and assembling costs. The design and sizing is done taking into account second order theory and nonlinear behavior of the guys. Designs are verified in real size prototypes that are tested in test stations until they collapse. The optimized design is verified when the failure of any element of the tower is produced before load steps going slightly beyond 100 % of the theoretical load of the design. This process requires the structural designer’s fine expertise. These plano-altimetric field surveys are the ones that describe the contour map in which the line is going to be placed. These surveys are not so different from the ones done for roads. 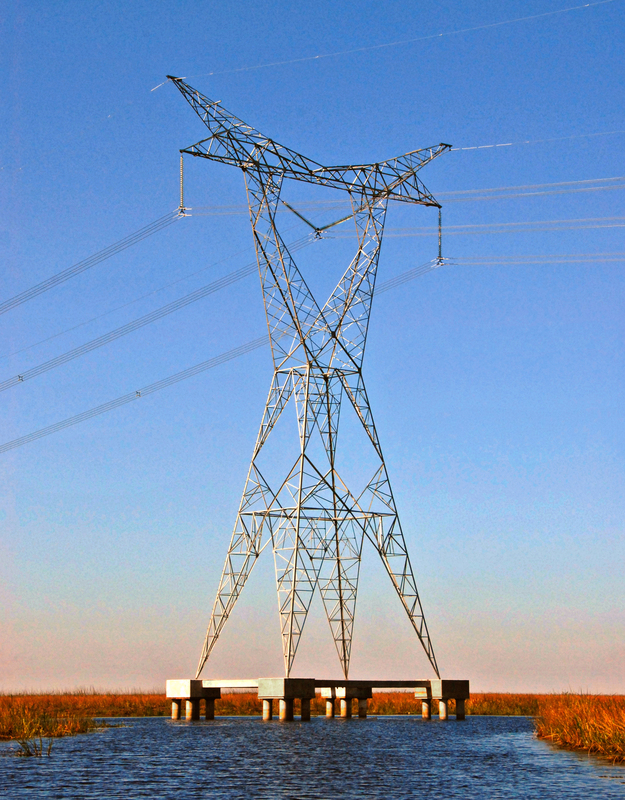 Even though it’s difficult to explain it in such a few words, we could say that in order to accomplish an optimized distribution of structures, the towers have to be distributed along the area at minimum cost and with such a disposition so as not to exceed the loads admitted by its elements – conductors, insulator chains, towers, guys, anchor bars, foundations – and, at the same time, minimal distances between conductors and ground have to be verified whatever the conditions of wind and temperature are. These structural and geometrical calculations are carried out by means of specific software. The most popular version is the PLS CADD of Power Line Systems of USA. Wherever a tower of 480. m and 550 m. is going to be placed; soil, water and electric resistivity studies are performed. The characteristics of these studies are similar to those for other type of designs. These designs employ traditional methodology with some technological components of their own and with some operative constrains of this particular type of work, but they are framed in the traditional design of foundations. There are other less complex parts of design that are not mention here in order so as not to fill this article with descriptions that doesn’t contribute to the conclusion of it.